When you need an office computer desk and you don’t want to spend a ton of money, then a used office computer desk from ROF is the perfect choice. Equally great for adding to an existing office or for furnishing a new one, our office computer desk selection has options for every style and every budget. Choose from the most traditional to cutting-edge and modern; you’re sure to find just the office computer desk you’ve been searching for. Whether you’re looking for an ultra-modern glass and metal design or a more traditional solid wood with brass accents, we have a used office computer desk to suit your office décor. Plus, because all our office computer furniture is built by reputable manufacturers, you can trust the integrity of your office computer desk. With only the finest materials, not particle board or cheap metal, each desk we offer is built to last many years with superior beauty. With furniture from ROF, you get all these benefits plus up to 80% off of the item’s original cost. 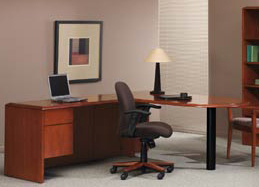 To learn more about a used office computer desk from ROF Furniture, call or e-mail us today.